The month of October brings a unique celebration with it. And no, we are not talking about costumes and candy. Instead, we are focusing on chili. This month we celebrate National Chili Month. This warm bowl of stew brings about many different opinions. If you are from Texas, then you most likely have some strong feelings. Chili is Texas’ state food. President Lyndon B Johnson was such a fan of the food that his wife had the recipe printed thousands of times because of how often people asked them for it. The thing that you will find the most constant debate about chili, is what goes in it. For the most part, people will agree that there is a tomato base, a form of meat and spices. From there, almost anything is permissible. In some chilis, you will find different types of beans, corn, celery, and other vegetables. In others, you will only find meat. Even the tomatoes could be replaced with a base of tomatillos as found in Chili Verde or in White Chili that features white beans, chicken and chicken broth. But the gold standard of chili is found in the various chili peppers that go into making this delicious concoction. Hatch chiles are a favorite, as well as jalapenos, chipotle peppers, New Mexico red chile, poblano chilis and so many more. Each of these different peppers and chilis makes a unique flavor palate that changes how the soup will taste. Ever heard of 5 alarm chili? These particular stews embrace the heat and add peppers to bring in some spice to their chili. 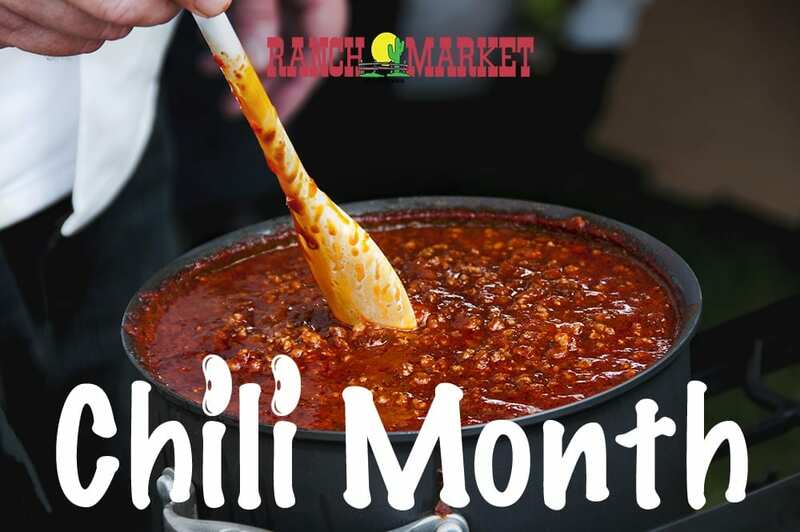 If you want to try your hand at making chili in any of its various forms, make sure to stop in and see us Redlands Ranch Market. We have everything you need from chiles to spices to fresh meats to create the perfect pot of chili. As you continue to celebrate National Chili month, maybe consider throwing a shindig to commemorate and have each person bring an ingredient to make one big pot of chili. Or maybe have a chili cook-off to see who can make the best chili in your friend group. Regardless, we hope you have a great time with this fantastic dish.